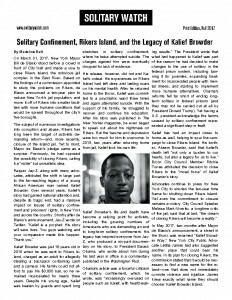 The only people who cannot access Solitary Watch’s work online are also its most important potential readers: the men, women, and children who live in solitary confinement. For this reason, we have long been producing a print edition in newsletter format, published as many times a year as we can afford. The print edition now reaches thousands of incarcerated individuals, and every week we receive close to 50 new requests from inside prisons, as word of mouth spreads by the various means people use to communicate while locked down alone 23 hours a day (for example, “fishing,” a practice described in detail in this story). It is always difficult to decide what stories and “news briefs” to include in our print edition. Because people in solitary deserve to know the truth about the practice they are enduring, we report on the ever-increasing body of evidence showing the harms caused by prolonged isolation. But we also share news of the growing movement against long-term solitary. Our readers inside know better than anyone how intractable the carceral state can be, and they know that change will take time. But many write to tell us how much it means to them that people on the outside are aware of their existence, acknowledge their suffering, and care enough to try to stop it. Others respond with the remarkable first-hand accounts that make up our “Voices from Solitary” series. Our Fall 2017 print edition, below, went out to more than 5,000 people, along with our annual holiday card featuring an image created by someone an artist held in solitary. If you know someone in solitary confinement who would like to be added to our mailing list, please email their mailing address to info@solitarywatch.com. The printing and mailing of the Solitary Watch print edition are made possible entirely through the generosity of our readers in the free world who support our work. This entry was posted in Lifelines to Solitary and tagged newsletter, Solitary Confinement, Solitary Watch. Bookmark the permalink. Hello Betsey. We will send the most recent print edition to your pen pal right away, and will make sure he receives future issues. I have removed his name from the comment because it is public, but we have added him to our mailing list. If you want to be in touch in the future feel free to email us at info@solitarywatch.com. Thank you for your participation in Lifelines to Solitary!